From Goodreads ~ From former VJ Christopher Ward, comes "Is This Live? ",a book in the tradition of "Mondo Canuck" and "I Want My MTV", capturing the pure fun and rock 'n' roll rebellion of the early years of MuchMusic, giving readers access to a major nostalgic touchstone of their youth. This is the story of the first 10 years of the Nation's Music Station. When MuchMusic launched in 1984, it was truly the Wild (Canadian) West of television - live, gloriously unpredictable, seat-of-the-pants TV, delivered fresh daily. Much was the dream child of TV visionary Moses Znaimer and John Martin, the maverick creator of "The New Music". An entire generation of Canadians lived and breathed TV's new kid in town and because it was live and largely improvised, viewers and VJs both shared the experience and grew up together, embracing the new music that became the video soundtrack of our lives. The careers of Canadian legends like Glass Tiger, Colin James, the Parachute Club, Honeymoon Suite, Blue Rodeo, Corey Hart, Jane Siberry and Platinum Blonde were launched when Much brought them closer to their fans. Much also brought us international acts and events like the Bon Jovi BBQ and Iggfest, with Iggy Pop improvising songs in the midst of his fans on the sidewalk on Queen Street. This was also an era in which music found its conscience with events like Live Aid and the Amnesty International Human Rights Now! tour. And Much covered them all. With stories of the bands, the VJs, the music, the videos, the style and the improvisational approach to daily broadcast life at Much, and told by the people who were there - the colourful cast of on-air VJs, the artists who found their way into the living rooms of the nation as never before, and the people behind the camera - "Is This Live?" delivers a full-on dose of pop culture from the 1980s and '90s, when the music scene in Canada changed forever. MuchMusic was a music station that launched in 1984 in Canada (three years after MTV) with a focus on music programming, including blocks of music videos and original series focusing on musicians and artists. Before MuchMusic, there were very few shows to watch music videos so it was quite exciting when the station started (I was in my early 20s). Christopher Ward was one of the original VJs at MuchMusic. This book is about the beginnings of MuchMusic. The chapters include discussions about the VJs, the shows, the artists (singers, groups, etc. ), best and worst interviews, special events and more, plus the impact that MuchMusic had on the artists' careers. In addition to Ward's thoughts and experiences, he also includes snippets of interviews with other MuchMusic VJs and their guests. Also scattered throughout the book are pictures of the VJs with various singers and groups. I rarely watch Much now as it's changed its format and plays less music. It was interesting reading this book and remembering the VJs and thinking, "I forgot all about him/her and I wonder what they are doing today." Plus it provides a behind the scene peak at what some singers and groups are really like. 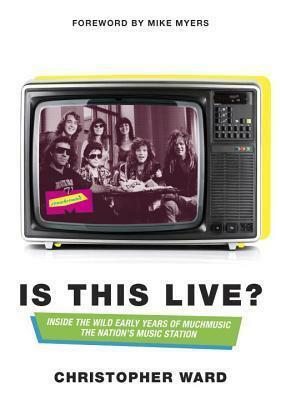 It's an interesting book if you were a fan of MuchMusic and 80s music in general, with more focus on Canadian talent. I liked the writing style. As a head's up, there is swearing.